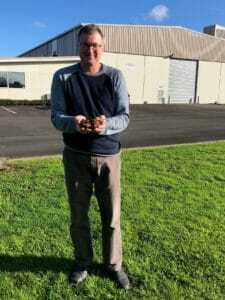 David Giles standing in front of Enzo Nutraceuticals’ Paeroa factory, with some pine nuggets in his hand. What began as a chance encounter ended up transforming David Giles’ business. In 1998 his family animal by-products business went to Canterbury University to get some research done and was offered the opportunity to become involved in a project to extract high quality polyphenols from pine bark. The research results were so compelling that David and his family subsequently ended up selling their original company and buying into Canterbury University’s pine extract business. The resulting company Enzo Nutraceuticals Ltd produces and markets Enzogenol®, a 100% natural extract from Pinus radiata bark that has exceptional antioxidant and natural anti-inflammatory properties. When asked how pine’s health-giving properties were originally discovered, David explains that conifer tea is a traditional Northern Hemisphere cold-climate food that has historically been taken as a way of getting plant-based nutrition during the cold and snowy winter months. Its antioxidant effect has been known for hundreds of years but not scientifically proven until the past three decades. New Zealand may not have long, cold, snowy winters but we do have excellent conditions for growing conifers. “The European’s can’t believe the quality of the pine bark grown here, or the lushness of our pine forests. We don’t have the Northern Hemisphere’s forest pest problems, which means that pines can be grown here without needing significant applications of pesticides,” says David. “In all of our years of testing, we have never detected any pesticide residues in our product. In my opinion NZ has the best pine forestry resource in the world and this means we can produce the best pine-based nutritional extracts. The pine bark used for Enzogenol® is hand-selected and harvested from central North Island plantations that are grown under very consistent conditions. Enzogenol® is extracted via the company’s proprietary water-based extraction process, which gives it a market advantage when selling into export markets such as India and Malaysia, whose large Muslim populations prefer water extracted ingredients compared to alcohol-extracted products. The vast majority of Enzogenol® is exported to natural health product manufacturers in powder form, with India, the USA and Japan being the largest markets. At present Enzo Nutraceuticals employs six full-time New Zealanders and a part-time manager in Japan but growth prospects are such that the Paeroa-based company anticipates expanding production capacity within the coming year. “We position ourselves as being a very science-focused company,” says David.